Review: If you are a regular reader or subscriber, you are probably aware that I’ve reviewed Red Seven before. I was invited to dine with some lady friends of mine this weekend, and had such a pleasant experience that I felt the need to revise my review. I didn’t originally give it a bad review; I just thought it had some potential and was hoping it would improve, and it did. 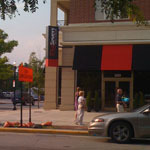 I love dining downtown, and the location of Red Seven couldn’t be better, right across from Chase and Riehle Plaza. It’s beautifully decorated, with an obvious amount of time, money, and energy put into the ambiance. Really quite nice. The menu has really expanded since my last trip there, and for the better. Six months ago I dined in to be given a one page menu that housed everything from starters to entreés, but now it’s quite expansive, with appetizers, salads, and a slew of menu choices. We got pot stickers and crab rangoon for starters. Both were good, but I preferred the pot stickers. For my meal, I chose the Penne pasta with grilled chicken, portabella mushroom, brandy cream sauce. It was good and extremely large. In fact, all the dishes were huge and we all took home sizeable containers. The service was very nice as well. Our waitress was friendly and attentive, and our food was served in efficiently. I’d say a definite improvement over my last visit there and I’m actually looking forward to going again. My husband also recommends the R7 Chop Chop salad from the lunch menu. Payment Methods: Cash and credit. Price Range: Pretty steep – you pay for ambiance. The least expensive items are the pizzas, which start at around $8, but they go up to over $20 for some of the steak options.